Powers/Abilities: Debra Whitman possesses the normal human strength level of a woman of her size, height and build who engages in extensive regular exercises. She has no known superhuman powers. Height: 5'6" Weight: 120 lbs. (Spectacular Spider-Man II#74 (fb)) - Debra married Mark Whitman while they were attending a college in the Midwest. Biff Rifkin also attended there, and had a crush on Deb, but kept it to himself. One day, Biff was shocked to see Deb on campus with a black eye. He finally went to her house and found Mark in the process of beating her. Biff beat up Mark, and brought Debra to a hospital, where her right arm was put in a cast. Despite this, Deb refused to admit to Mark's problems, but did eventually separate from him. 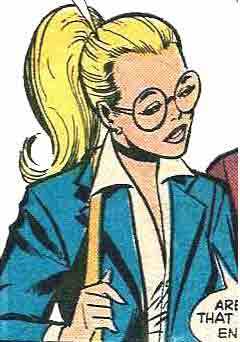 (Amazing Spider-Man I#196 (fb)) At some point, Deb Whitman moved to New York and became secretary to Dean Sloan at Empire State University. (Amazing Spider-Man I#196) After Peter Parker was led to believe that his Aunt May was dead, he told Deb, who was acting as Dean Sloans secretary, that he would be unable to attend any classes for a little while as there had been a death in the family. Deborah gave Peter her condolences and said she would relay the information to the Dean. (Spectacular Spider-Man II#36) - Deb hit her head under her desk looking for her errant shoe as Peter arrived to see her. She introduced him to Steve Hopkins, a teaching assistant for Professor Morris Sloan in the ESU biophysics lab. She later fled the ESU campus when Doctor Sloan accidentally revived the bee infestation known as Swarm. (Spectacular Spider-Man II#42) - Deb attended a gathering with other ESU staff/students on a ferry to Liberty Island to celebrate trimester break. During the trip, Deb confided to Peter her fears that she wouldn't accomplish anything with her life, but Peter bailed on her when he saw a message for Spider-Man sky-written above the Statue of Liberty. (Spectacular Spider-Man II#43) - Debra was held at gunpoint by men working for Belladonna who had come for chemicals in the lab. The men left when they had what they had come for. Later, Deb provided Peter with some groceries from 7-11 as he working, and he promised her dinner next week. (Amazing Spider-Man I#207) - Peter Parker and Deb Whitman went on a date to see Mesmeros hypnotism act on Broadway. Deb and Peter agreed that it was unentertaining and unfunny as Mesmero embarrassed those that he hypnotized. After the show, Deb wanted to continue their date, but Mesmero had requested an audience with Spider-Man, so Peter ditched Deb, saying he had exams the next day, which she knew to be untrue. Deb assumed that Peter just tired of her company, and went home feeling rejected. Later, after obtaining tickets to another Broadway show, Peter invited Deb on another date, and she happily accepted. However, Peter never showed up, as he got caught up fighting Mesmero as Spider-Man. Deb felt rejected once more. (Untold Tales of Spider-Man: Liveswires) - Steve Hopkins literally bumpted into Debra Whitman. Hopkins dropped a prop arachnid. Whitman retrieved it and tried to return it to Hopkins. Mistaking Parker for Hopkins, she facetiously and (unknowingly) called him by his alter ego's code name. (Spectacular Spider-Man II#46) - Peter apologized to Deb for running out on her, and promised her a make-up dinner. (Spectacular Spider-Man II#47) - Peter hurriedly escorted Deb back to her apartment after a date to investigate an impersonation as Spider-Man, but she confused his hurried attitude with him not liking her. They met again the next day, but when she offered to buy him dinner, he was too engrossed in current events to notice and accidentally snubbed her again. (Spectacular Spider-Man II#48) - Debra visited Peter in his apartment while he was still in his bathrobe (he was washing his Spider-Man costume), and trying to fix his lamp, accidentally setting his toy bear on fire. After cleaning up the mess, Peter got dressed to take Deb out for coffee. (Amazing Spider-Man I#209) - Peter Parker and Deb Whitman were on a walk through New Yorks Soho district and Deb was worrying about her elderly uncle, who owned a shipping yard and was being threatened by a bunch of thugs, but was unable to defend himself due to his advanced age. Deb asked Peter to use his newspaper contacts to help, but he told her (uncharacteristically) that he didnt have the time. She apologized for bothering him and left, as usual, feeling shunned by Peter. (Amazing Spider-Man Annual#14) - Debra met up with Peter in Greenwich Village to attend a concert by the band Shrapnel, but Peter cancelled on her. Peter wound up attending after all, and met up with Deb for coffee after to try and smooth things over, but ran out on her when people began being possessed by Lucius Dilby. (Amazing Spider-Man I#210 (fb)) At some point, Deb started seeing Madame Web as a fortune teller. (Amazing Spider-Man I#210) - Deb told Peter about Madame Web, and he expressed a lot of skepticism about fortune tellers. Before long, Peter had to leave because he had plans at the Daily Globe. (Spectacular Spider-Man II#50) - Debra was phoned in the middle of the night by Peter, who needed her to come with him to lunch the next day with his aunt and her new significant other, and had been told to bring a date. Debra agreed to help him. Debra and Peter met with Aunt May and Nathan Lubensky at the restaurant and started to become acquainted, when the "Bogus Alien" gang led by Mysterio broke in, intending to kidnap May to find the location of Dutch Mallone's treasure. Peter claimed to know the treasure's location to save his aunt, and was taken away as their prisoner. (Spectacular Spider-Man II#51) - Debra and Nathan helped May back to her nursing home, but as she was leaving the building, some of Mysterio's men kidnapped Deb, thinking that by threatening her they could make Peter more compliant. When Spider-Man appeared, Mysterio threatened her with a gun, but during the struggle Deb managed to grab a film-making model and smash Mysterio's helmet with it, cracking the glass so that he couldn't see. Deb ran away and found a phone, then called the police. She went looking for Peter, and discovered him in one of Mysterio's cells (Peter having quickly changed outfits). (Amazing Spider-Man I#211) - Deb expressed to Peter how utterly scared she was for her elderly uncle who was being threatened by a bunch of thugs who were demanding increased wages that her uncle could not afford to pay. Feeling that Peter didnt like her as much as she did him, she digressed and told him not to let her bother him with her troubles. (Amazing Spider-Man I#212) - Peter Parker called Deb and invited her to come with him on one of his photo assignments. He took her to the Daily Bugle where she met J. Jonah Jameson. Peter soon heard that Hydro-Man was looking for Spider-Man, and ditched Deb once again to go play hero. (Amazing Spider-Man I#213) - Deb and Peter went on a date, riding the Staten Island ferry near the Statue of Liberty. Deb had a great time and kissed Peter aboard the ferry. Afterward, she invited him into her apartment, offering to make them something to eat, but Peter, who realized that he had no idea how he felt about Deb and had been leading her on, declined and left, leaving Deb feeling spurned by Peter Parker. (Amazing Spider-Man I#215) - Peter stumbled into to Debras apartment for help following the beating he had taken as Spider-Man from the new Frightful Four. She helped fix him up and let him sleep on her sofa. The following morning when she made breakfast for the both of them and plans for a Broadway show. Peter, however, had to quickly dash out again for other responsibilities, an act which irritated Debra to debate her friendship with Peter. (Amazing Spider-Man I#216) Peter went to Deb Whitmans apartment for some company and care for his recent wounds, but found her with Biff Rifkin who, unlike Peter, had time for her. (Amazing Spider-Man I#217) - Peter Parker ran into Deb and Biff as they exited a movie theatre. Peter felt a little jealous of Biff, but politely conversed with the couple. As they left, Biff spoiled the end of the movie for Peter. (Spectacular Spider-Man II#55) - The next time Peter ran into Deb at ESU, she gave him the cold shoulder and refused to talk to him. (Marvel Team-Up I#106) - Deb noticed Peter rushing by her after he became aware of the Scorpion's escape from prison. (Spectacular Spider-Man II#56) - Debra watched as Steve and Philip rigged up a ladder from the ceiling in an attempt to find out why Marcy always wore hats. Peter thought Marcy deserved her privacy. It turned out that Marcy had been wearing a wig, and she ran from the room in tears when this was revealed. Peter ran after her, but Deb had to call him away when his Aunt May phoned him. Deb offered to help him after he took the call, but he refused, to her annoyance. (Amazing Spider-Man I#218) - Peter ran into Deb in the halls of Empire State university and tried to reconcile with her, asking her out for coffee. Deb considered it, but before she could answer, Biff Rifkin came along and told Deb he made dinner reservations for them. She then left with Biff. (Marvel Team-Up Annual#4) - At a charity show attended by Steven Grant (Moon Knight), Luke Cage (Power Man), Daniel Rand (Iron Fist), Matt Murdock (Daredevil) and Marlene Alraune, Deb noticed the Purple Man step up to the podium who had been sent to slay enemies of the Kingpin. Murdock thinking fast used the lit cigar of another guest to light an empty seat and screamed fire as a distraction to drive Deb and all the other innocent by-standers out of harm's way. (Spectacular Spider-Man II#58) - Debra watched as Steve was "punished" by the others for what he had done to Marcy, but the punishment was nothing more than a pie in the face. Marcy revealed her new look, no longer wearing wigs, and Dr. Sloan threw a party for them. Peter met up with Deb for dinner that night, but he called the night short. (Amazing Spider-Man I#221) - Biff Rifkin escorted Deborah to Mickeys Country and Western Club in Brooklyn where they ran into Peter Parker. She lamented not being with him and having to accept Bifs companionship, but reminded herself that Peter was never there for her. Peter, however, realized something in the drinks of the customers had poisoned them, and was forcing them to act irrational and violent. As Spider-Man, he rushed to get an antidote for the crowd and returned to administer it. (Spectacular Spider-Man Annual I#3/3) - At ESU, Debra laughed as Steve placed an "I'll Fall For Anything" sign on Peter's back as a gag. (Spectacular Spider-Man II#60) - Deb invited Peter to her apartment for dinner, and he accepted, but found Biff was already there. Peter was surprised to learn from Biff that Debra made much more money than he did, and wound up running out when he heard on TV that the Beetle was attacking the Gibbon. (Spectacular Spider-Man II#61) - Deb and Biff were walking past campus when they saw Marcy being loaded into an ambulance, having been attacked by Moonstone. Deb was surprised to hear from a policeman that Peter had saved her life and remained with her until the ambulance came. (Spectacular Spider-Man II#62) - Deb was present as Peter prepared for an experiment on ESU using gold, and she was concerned to see that Peter was now flirting with Marcy, when she had been trying to get his attention by dating Biff. Debra tried reading "Across the Frontiers" to better understand the science Peter was so fascinated with, but finally admitted to herself that she couldn't understand what she was reading. When the Goldbug broke in to steal the gold Peter was working with, Deb was sprayed with the Goldbug's gold dust. Peter was able to concoct a quick antidote to remove the dust. (Amazing Spider-Man I#225) - Foolkiller, in his civilian guise of Greg Salinger came to Deb looking for Peter Parker. When she did not know where he was, Salinger called her a fool and left, leaving her quite annoyed. Later on, Peter Parker came looking for Salinger, Deb informed Peter that he had been there earlier, and expressed her angst at being called a fool, which made Peter realize that Greg might be the Foolkiller. (Spectacular Spider-Man II#65) - Debra tried to console Peter after he was told by Dr. Sloan to consider giving up his teaching assistant position, but Peter wouldn't open up to her. When she told Marcy about Peter's problems, Marcy went after him, and he wound up sharing with her, to Deb's chagrin. (Amazing Spider-Man I#227) - As Peter walked into ESU, Deb and another student reminded him he had a huge paper due at the end of the day. He finished it in record time. (Spectacular Spider-Man II#66) - As Deb was on a date with Biff, she noticed Peter and Marcy together, on a study date. (Amazing Spider-Man I#228) - Deb took Peter with her to an auction of all of a deceased millionaires antiques. Deb was very intrigued by the history of the antiques, but as she picked up an antique to study it, another millionaire who had just bought all of the antiques yelled at her. She was shocked at how rude some people could be. Before long, Peter ditched her to follow his spider sense as Spider-Man, leaving her, as usual, feeling rejected by him. (Spectacular Spider-Man II#67) - When Peter slept in one day, Dr. Sloan had Deb phone him to tell him he had missed his lab time. When Peter arrived on campus he smashed a locker door in frustration at his life's complications. Deb saw this, and asked to look at his hand, but he brushed her off, and she was crushed by his behavior, and ran off crying. (Spectacular Spider-Man II#69) - Debra tried to confront Peter about what had happened, but he brushed her off, blaming her for what had happened by "making up" her story about him making her cry. However, what Debra was truly conflicted about was her knowledge of his secret identity. (Spectacular Spider-Man II#70) - Debra tried to confront Peter again, but he ran off when he heard about Cloak and Dagger battling Silvermane. She suspected that he was off to participate in the fight as Spider-Man. Debra began to question her sanity. (Marvel Two-In-One#90) - Deb accompanied Peter to check out a Renaissance Fair in New York's Central Park for the Daily Bugle, but the spirit of an extradimensional sorcerer named Sardeth the Sorcerer escaped his world and took mental possession of one of the entertainers at the fair. As Deb escorted Alicia Masters to safety, Alicia's boyfriend, Ben Grimm, the Thing, teamed with Spider-Man to confront Sardeth and keep him from becoming a major nuisance. (Amazing Spider-Man I#231) - Betty Leeds called the Empire State University office looking for Peter Parker. Deb answered the phone and told Betty that she didnt know where Peter was, but that she would tell her if she saw him. (Amazing Spider-Man I#232) - After Peter decided to leave Empire State University, his friends, including Deb Whitman, planned to throw him a farewell party. However, they failed to get him to show up. Deb worried about her suspicions regarding Peter, but said nothing. (Spectacular Spider-Man II#72) - Deb went to see her psychiatrist Dr. Bailey Kuklin, and told him that either Peter Parker was Spider-Man, or she was insane. (Spectacular Spider-Man II#74) - Dr. Kuklin had another session with Debra, with Peter secretly listening. Dr. Kuklin asked Peter to masquerade as Spider-Man to make her realize her suspicions were false, but he refused. Peter was referred to Biff by Dr. Sloan to learn what Debra had gone through, and Biff told Peter about her marriage. Peter finally went to Deb's apartment as Spider-Man and had her remove his mask. However, when she saw that he was Peter, she decided that he had pretended to help her, and was shocked out of her psychiatric problems. She thanked Peter for being a good friend. The next day, Peter saw Debra off as she set out to the Midwest to divorce Mark and finally start her life over. They shared a goodbye kiss before she got on her bus. (Friendly Neighborhood Spider-Man#16 (fb) ) - Deb was unemployed when her mother got sick. No insurance wanted to pay the bills and soon Deb was highly in debt. Around this time Jameson offered her a lot of money for a book on her relationship with Peter Parker aka. Spider-Man. (Friendly Neighborhood Spider-Man#14) - Deb had just received her book, but she didn't like the title "Two-Faced: How Peter Parker Ruined My Life" and how her publisher had changed the story. She called Alex, who told her that the changes and the title were needed to sell the book. Alex hung up on her, Deb began to cry and then left to catch her plane to NYC for a book signing. (Friendly Neighborhood Spider-Man#15) - Before the book signing at Barnes & Barnes Booksellers began, Deb was confronted by Betty Brant, who accused her of betraying Peter. Deb didn't have anything to say when Betty told her about all the misery connected to Spider-Man she had to live through. Later at the book signing Flash Thompson tried to confront Deb as well, but Betty stopped him with a kiss. A few seconds later the Vulture broke through the skylight and attacked Deb to get Spider-Man's attention. Betty shot at Vulture and then Spider-Man appeared to take him to the outside. (Friendly Neighborhood Spider-Man#16) - Deb, Betty, Flash and many other people watched Spider-Man falling from the sky after he had been dropped in mid-air by Vulture. Deb screamed at him to wake up and was relieved when he was able to save his own life. She slapped Flash when he asked her if she would've been happy if Spider-Man had died and then left. That evening Deb visited Betty to show her the high medical bills for her mother. She revealed to Betty that Jameson came to her for a book on her relationship with Peter when she really needed the money, but the changes to the book made her relationship with Peter look far worse than it was. Betty helped Deb to clear Peter's name. They went to the Daily Globe and Deb revealed to them how Jameson's ghost writers had changed the facts about Deb's relationship with Peter. Comments: Created by Marv Wolfman and Al Milgrom. Despite being one of Spider-Mans seldom seen supporting characters, Whitman actually made it to star briefly in the Amazing Spider-Man Animated Series on FOX in the mid 1990s, where she ultimately became Flash Thompson's girlfriend. If anyone deserves to come back as a costumed crime-fighter or criminal out of Spider-Mans supporting characters, Debra Whitman would be an interesting choice. Peter Parker acted like a real heel during his entire relationship with Deb. He blew her off at every turn, spurned her affections, and then sought her out and led her on whenever he was bored and needed company, only to ditch her as soon as he had something else to do. He never showed any real interest in her until she was with someone else. The Steve Martin reference in Marvel Team-Up Annual#4 may or may not be topical considering he's a much bigger celebrity now than he was in the Seventies when this story was originally based. Thanks to D.B. Sommer for catching Spectacular Spider-Man Annual I#3! Profile by WillU, Stunner, Per Degaton and Prime Eternal. Update by Markus Raymond.